A kitten's best bet is to stay with his mother. It can be an exciting thing to stumble across a momma cat with a furry bunch of baby kittens at her side, but it can also mean a lot of responsibility. The care you give will greatly depend on whether the mother cat is friendly or feral. 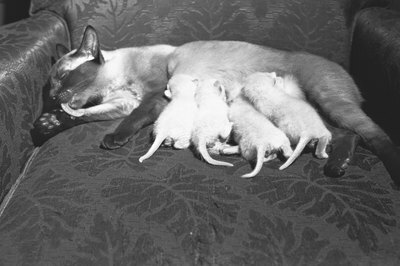 You'll need to know if momma is feral or friendly so you can decide how to proceed with looking after the small family. Watch her reaction upon seeing you. A feral cat will be skittish and run away, or sometimes hiss and growl at you before splitting for the nearest exit. A tame or friendly cat will possibly come up to you if you call her or will let you get closer. Even a tame cat may run away from you, but generally she will be more willing to let you get close. If you've rescued the kittens from the outdoors or you know that the mother cat isn't used to human interaction or being inside, you'll need to give her some space and a quiet area to call her own. 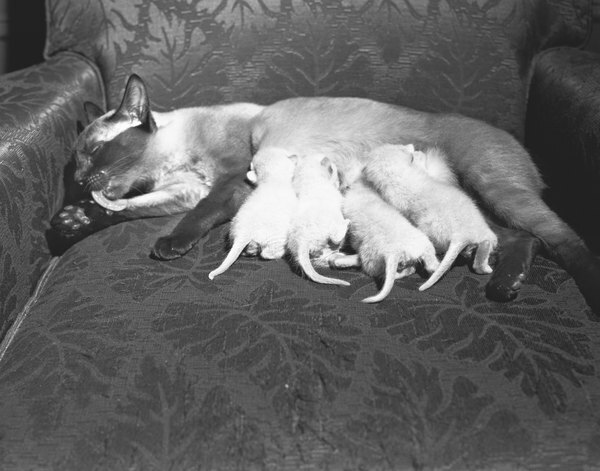 Mother cats are known to move their litters around, particularly if they sense danger. Playing hide-and-seek every day with the babies isn't a fun game, so keeping her contained is a safe way to give her peace. A small bathroom will be ideal, as would a large dog crate. Within the room or crate, make a small nesting box for the momma to use to cuddle and feed her kittens. You'll also want a litter box with nonclumping litter on one side and a place for food and fresh water on the other side. If you've found a feral litter of kittens and their mother, it may be best to leave them outside. This may seem cruel, but feral cats don't take to being locked in a house very well, especially with potentially dangerous humans. If their location is safe, such as in your yard under some shrubbery, provide the momma cat with food and water every day and watch the family grow from a distance. Once the kittens are weaned, you can then choose to trap them, neuter them and adopt them out to good homes with the help of a rescue organization. It is also a great, humane choice to trap the momma cat at this time, have her spayed and then returned to her outdoor home. Fresh food and water are important every day for either indoor families or a feral family. Use a high-quality wet food for the mom. When the family is indoors, change the nesting box material daily. You can use towels, blankets or newspaper as the bedding material inside the box. The kittens will start the weaning process at about 4 weeks old, so you'll need to be prepared for hungry kittens with massive appetites and an outstanding ability to make a mess. The kittens are ready for adoption between 6 and 8 weeks old, so handling them at a young age will help get them used to human hands. Feral kittens are another story, as the mother will surely move her litter if you handle them too often.